Since the survey by Windrum et al. (Journal of Artificial Societies and Social Simulation 10:8, 2007), research on empirical validation of agent-based models in economics has made substantial advances, thanks to a constant flow of high-quality contributions. This Chapter attempts to take stock of such recent literature to offer an updated critical review of the existing validation techniques. 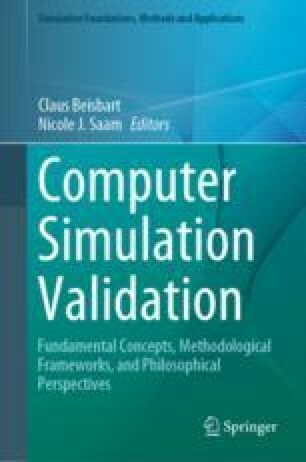 We sketch a simple theoretical framework that conceptualizes existing validation approaches, which we examine along three different dimensions: (i) comparison between artificial and real-world data; (ii) calibration and estimation of model parameters; and (iii) parameter space exploration. Finally, we discuss open issues in the field of ABM validation and estimation. In particular, we argue that more research efforts should be devoted toward advancing hypothesis testing in ABM, with specific emphasis on model stationarity and ergodicity. We gratefully acknowledge the support by the European Union Horizon 2020 research and innovation programme under grant agreement No. 649186 - ISIGrowth. Further, we express our gratitude to Francesca Chiaromonte, Giovanni Dosi, Mauro Napoletano, Marcelo Pereira, Amir Sani, and Maria Enrica Virgillito for helpful comments and discussions on the issues surveyed in this chapter. Platt, D., & Gebbie, T. (2016). Can agent-based models probe market microstructure? Papers 1611.08510, arXiv.org.